A spark is a discontinuous type of discharge that occurs in several phases. Initially, the energy needed for the spark discharge is supplied by a reservoir capacitor of a given capacitance. The interval between two sparks is used to recharge the capacitor (1). Every spark then has to be ignited, for which a high-voltage pulse of several kilowatt is used (2). This creates an almost constant burning voltage between the electrode and the sample (3). The spark then runs for several hundred µs. Strictly speaking, both sparks and arcs play a role in spark spectrometry. A continuous arc can be created with relatively simple excitation generators in an air atmosphere. For quantitative analyses, though, spark generation in an argon atmosphere provides numerous advantages. For instance, spark spectrometry with argon prevents sample oxidation and thus any fundamental changes in the sparking conditions during an analysis involving several thousand sparks. 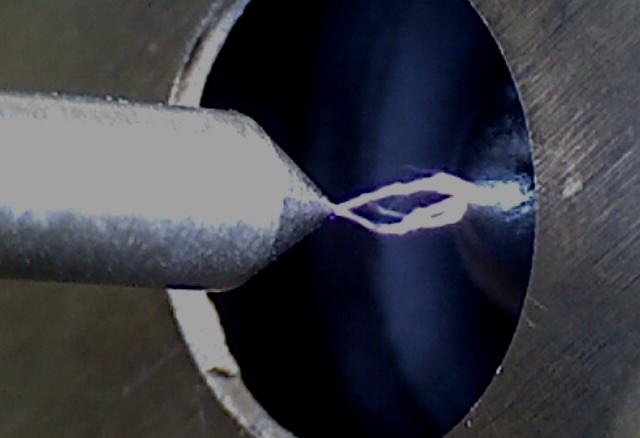 Spark excitation therefore delivers a substantially higher degree of repeatability than arc excitation. The latter named method plays a role in mobile spectrometers used for material recognition. As a rule, the sample material is conditioned prior to the analysis phase. During this pre-sparking phase, the sample material is homogenised, for which higher spark energies are typically used than for measuring phases (HEPS – High Energy Pre-Sparking). In the early years, the excitation conditions of a spark discharge used to be characterised by three parameters, charge capacity C, inductivity L and resistance R, and the first excitation generators filled entire rooms. Apart from the analytical sparking distance, a wear-prone auxiliary sparking distance was also typically used. However, the ability of this kind of excitation generator to produce constant discharge parameters was limited. To ensure an acceptable degree of long-term stability of the analytical data, it was often necessary to perform control or corrective measures (recalibration) when using such excitation generators. On top of that, it proved to be difficult to create numerous different discharge forms, as are absolutely necessary when using multi-matrix devices. Nowadays, excitation generators can be produced using semiconductors and no longer require an auxiliary sparking distance. They are characterised by a high degree of repeatability, good long-term stability and no maintenance needs. “Digitalisation” has become something of an inflationary term in descriptions of spark generators. An electrically generated spark under an argon atmosphere can be used to excite a large number of elements. Plasma temperatures of over 10,000 K are reached. The resulting spectra are called “spark spectra” and display numerous atomic and ionic lines. Spark excitation can even be used to analyse non-metals like N or O. The alternative arc excitation, which requires several Ampere of current, creates plasmas of lower temperatures and delivers little spectral background and only few ionic lines (“arc spectrum”).The field of spark spectrometry uses the advantages of this method by generating arc-like discharge forms for the detection of several elements. The many advantages of spark spectra come at the expense of several negative boundary conditions that have an effect on the optical layout and the evaluation algorithms. In comparison to low-pressure discharges, spark spectrometers deliver relatively broadened emission lines with a half-width value of about 20 pm. As a result of the optically dense spark plasma, non-excited atoms can absorb light, which leads to a self-absorption effect that increases proportionately with the number atoms of the same element present in the plasma. As a consequence, spark spectrometric calibration functions hardly ever display linear relationships. Furthermore, calibrating spark spectrometers is a complex task due to unavoidable line overlaps and the corrective calculations that are necessary as a result. Hundreds of calibration standards often have to be measured for a single metallic matrix so that optimal calibration functions can be calculated for all element channels. The electrical energy needed to create the spark in the spark stand is delivered by the so-called spark generator.When generating this excitation energy it is critical to ensure that the power functions provided are extremely reproducible and can be individually modulated to suit the various requirements of the analysis tasks – in the most extreme case for every analytical program and every exposure time. This knowledge having spawned an early wish to use digital technology to contain these problems, it then found fertile ground at OBLF: we already began producing our spark generators exclusively on the basis of semiconductor technology at the beginning of the 1980s – a time when our competitors still had to use an auxiliary sparking distance. As a result of this, our development work to produce a digital spark generator made rapid progress and enabled the successful integration of this technology into OBLF spectrometers at a very early stage of digitalisation. Generators of this kind are called GDS spark generators (Gated Digital Source) and have by now become a firm fixture of the analytical landscape. In fact, they have been state-of-the-art for some years now. From an analytical point of view, these digital spark generators constitute a new dimension because they can deliver the requisite special power function in practically limitless form. As a result, they no longer fit into the usual definition schema with parameters like capacitance, inductance, Ohmic resistance, spark succession frequency or increase of the pre-sparking energy (HEPS). Such parameters are irrelevant when using GDS spark generators because they do not contain any classic discharge circuits that would limit their controllability. Apart from guaranteeing superior flexibility, the digital technology of these spark generators also guarantees extremely reproducible results and naturally renders them maintenance-free.